3. 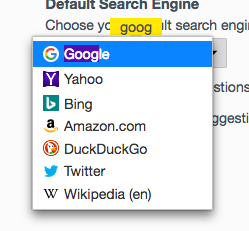 Search for "yahoo" in the search field. Menulist items should be highlighted if they matched the keyword. Mike, I suspect this regression is due to bug 1352481 after resolving merge conflict. Please review it kindly thanks! This looks okay, though note that [when the item is selected in the menupopup](http://i.imgur.com/XJ9Wd86.png), the highlight changes. Not sure if that's desirable or not, but thought I'd point it out - perhaps something worth running by UX. Thanks for bringing this up. I had a conversation on this topic with visual designer yesterday and here is latest "Search Highlights Visual" spec for this.